We have a wonderful Scots word up here: "Drookit", which although it can occasionally refer to the weather (very, very wet), is generally used to describe the condition of those unfortunate to be caught out in it. Son and I travelling down to The Big City for a couple of football matches, had enjoyed a train journey south in fine weather, but upon disembarking the tube at Leyton Station were dismayed to discover East London was in the midst of a downpour. Not just a heavy shower, but one of those violent monsoon-types where the raindrops bounce a foot back up into the air after hitting the ground, and little streams and brooks pop up on the roads and pavements everywhere. We cowered at the station entrance hoping for a respite, but as 3 o’clock drew nearer, we decided there was nothing else for it but to endure a comprehensive soaking. Thus did the opening of the match find us squelching and steaming gently in the Family Stand of the Matchroom Stadium (or Brisbane Road, as it was once known). The very epitome of "Drookit", in fact. I am guessing there was probably only one Orient player who, as well as being as drookit as ourselves, would have known the meaning of the word. This being defender and fellow Caledonian Scott Cuthbert. A former Celtic youth player, Cuthbert I knew had joined Orient in 2011 following a patchy period at Swindon Town. I had thought he generally played in central defence, but I noted he lined up at right-back this afternoon. And I have to say, one second-half aberration apart where he let visiting forward Ryan Colclough through, our Scott did rather well I felt. In fact all of the home lot enjoyed an accomplished first-half, coping much better than the Crewe crew did with the sopping wet conditions; reaching the break leading 2-0 through goals from Moses ODUBAJO and David MOONEY. Orient even permitted themselves the luxury of a missed penalty kick. The rain continued to hammer down during the break and I began to wonder if we would see a second period at all – we discovered a match at Charlton Athletic, just a few miles south of Leyton had been abandoned at half-time. But the rain eased off a touch once play re-commenced, a fact which appeared to encourage the visitors, who bossed much of the second-half possession without creating an awful lot: although Chuks Aneke was doubly unlucky to see one effort tipped over and second hit the crossbar. But Orient negotiated this sticky spell to maintain their 100% start to their season. being bought from Mitcham Greyhound Stadium. during the stand's tenure at Mitcham Greyhound Stadium. I am aware that O’s owner Barry Hearn is presently expressing concerns that the decision to allow West Ham United to move into the nearby Olympic Stadium may be detrimental to his club. But I cannot really see it. 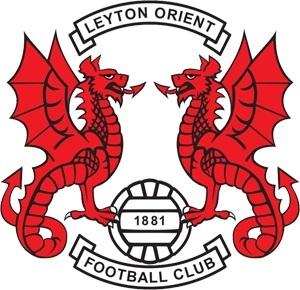 I should guess any fickle floating fans residing within the Leyton Orient catchment area will have long since migrated to one of the bigger lads, if they were of a mind to do so. And as for the Olympic Stadium, I was there for the athletics at 2012, and can attest that it will make a crap football venue even if they do remove the running track. And with the O’s performing as well as they are, one has to ask why anyone in the right mind would wish to pay twice as much to endure Big Sam’s Route One nonsense. Either a hard night last night, or perhaps rugby is his game? - this chap yawned his way through much of the afternoon. Always good advice, I think. paid through the nose to purchase these flats in the first place. An idea of the underfoot conditions. ..........................which visiting No 12 George Ray heads clear.